Race Fans! 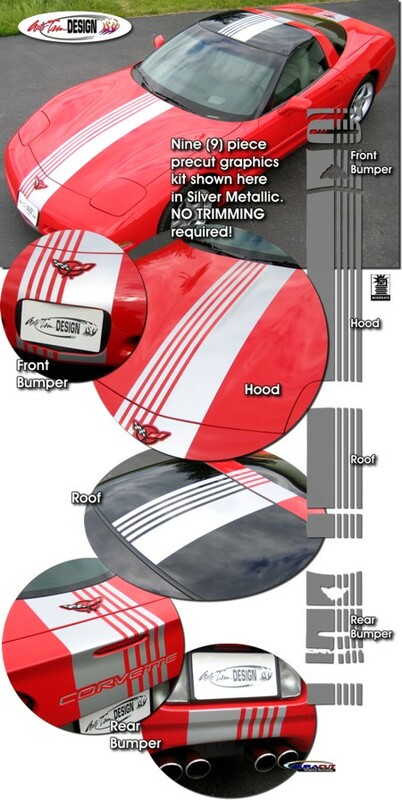 Trick Out your '97-'04 Chevrolet Corvette C5 Coupe, Convertible or Z06 with these awesome Corvette Racing C6.R stylized Bumper, Hood, Roof and Rear Deck Lid Rally Stripe graphics. Coupe (shown) & Z06 kits come with nine (9) pieces while the convertible is provided with eight (8) pieces. They're PRECUT and ready to install in a wide variety of colors - there is NO TRIMMING required! This stripe package is not just a set of 14" (35.56cm) strips in a box. Our graphic kit consists of prefitted and contoured pieces as shown in the illustration. Stripe width is approximately 14" (35.56cm). Includes easy-to-follow general online instructions and care guide. Trimmable Spoiler Kit #ATD-CHVCRVTGRPH77 consists of one (1) 16" (40.64cm) long piece that can be trimmed during installation for custom spoiler applications.